How can I sign up to support the Y through the Kroger Rewards Program? Unlimited chat time with friends - we are one of Huntington gathering places. Get a friend or neighbor to join and have them be your workout partner. Check weekly schedule Pool & Open Gym Schedule at the front desk. For schedules of our pools and gymnasiums, check out "Calendars" page. *Monthly Bank Draft: You authorize your bank to automatically pay your monthly membership dues. Draft continues until you cancel in writing and turn in your membership cards. Thirty days notice is required when changing banks, accounts, credit cards or canceling a bank draft membership. Joiner’s fees will be charged for anyone lapsing more than 30 days on any membership. The YMCA accepts Master Card and Visa and Discover for your convenience. are $5.00 for a child, $10.00 for an adult and $20.00 for a family. Corporate memberships are available for companies maintaining at least 5 employees with YMCA memberships. The employee receives a discount on annual or bank draft membership dues. Joiner’s fees will not be discounted. Contact Pam Santos Membership Director for details. A program member is an individual who is not a Huntington Family YMCA Facility member, but is involved in a specific program. Program participants have access only to that area of the facility, which they have signed up. We ask members to scan their YMCA card when entering the facility. YMCA cards are not to be shared and are the property of the YMCA. The fee for a lost card replacement is $ 5.00. 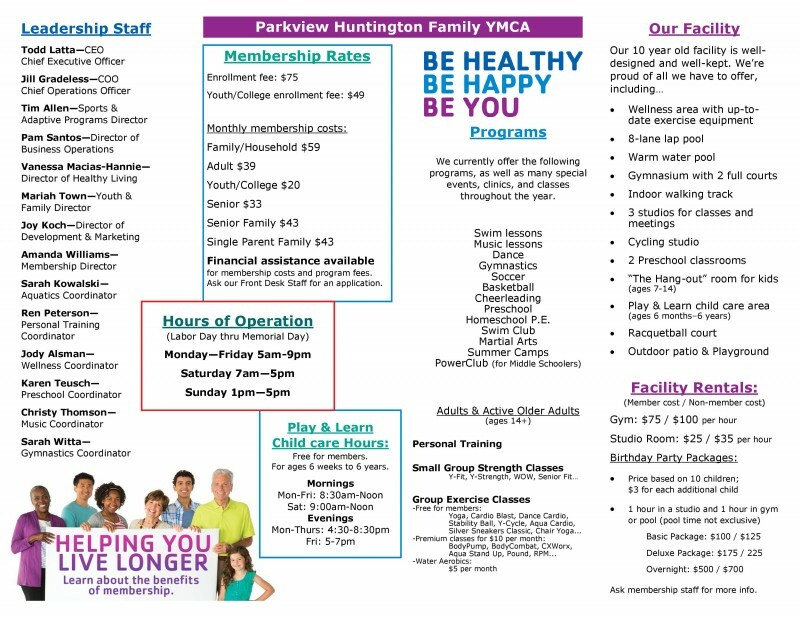 Military personnel on leave shall be welcomed into the Parkview Huntington Family YMCA on a day-to-day basis at no charge for a period of up to two weeks. Leave paperwork must be presented along with a valid picture I.D. card. A new $31 million initiative gives military families access to memberships and programs at area YMCAs and across the country. A partnership between the United States Department of Defense (DoD) and the Armed Services YMCA is giving families of active military personnel FREE access to youth development, family strengthening, and health and well-being programs at local YMCAs across the country. Through the $31 million initiative, membership fees for up to 18 months will be funded by the DoD. The initiative will fund the cost of memberships only. Any YMCA fee-based activities will not be included. As always, with the YMCA, scholarships are available for all programs and services.